Millions of people in developing countries rely on affordable generic medicines produced in countries like India to stay alive. But the European Commission is pushing aggressive policies that will severely restrict people's access to these life-saving medicines. The attack is taking a number of different forms - free trade agreements, international treaties, customs regulations. If Europe succeeds, millions of people across the developing world could see their source of affordable medicines dry up, as generic companies will no longer have the space to produce or sell them. 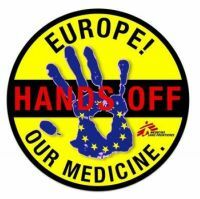 Laurier Health Sciences students: send letters now & demand Europe gets its HANDS OFF OUR MEDICINE! Recently, there has been a major disaster in Japan with an earthquake of a magnitude of 8.9 hitting the northeastern part of Japan. The earthquake was followed by a tsunami that wiped out many towns along the coast line, and at some points, reached 10 km inland. A nuclear reactor damaged by the earthquake is now at risk of a catastrophic meltdown with sea water being pumped in as a last resort to prevent the radioactive cores from overheating. So far, almost 2000 people have been killed and 3000 people remain missing. However, this number is bound to go up as search and rescue efforts have just begun. 91 countries and regions along with 6 international organizations have offered assistance to help those affected in Japan. The International Committee of the Red Cross (ICRC) is one such organization, providing more than 80 health and disaster relief teams. If you want to find out ways to help those in Japan through the Red Cross CLICK HERE!